I arrived at the entrance of the Click Ponds near the Viera Wetlands just as this Loggerhead Shrike did with a scrumptious meal. 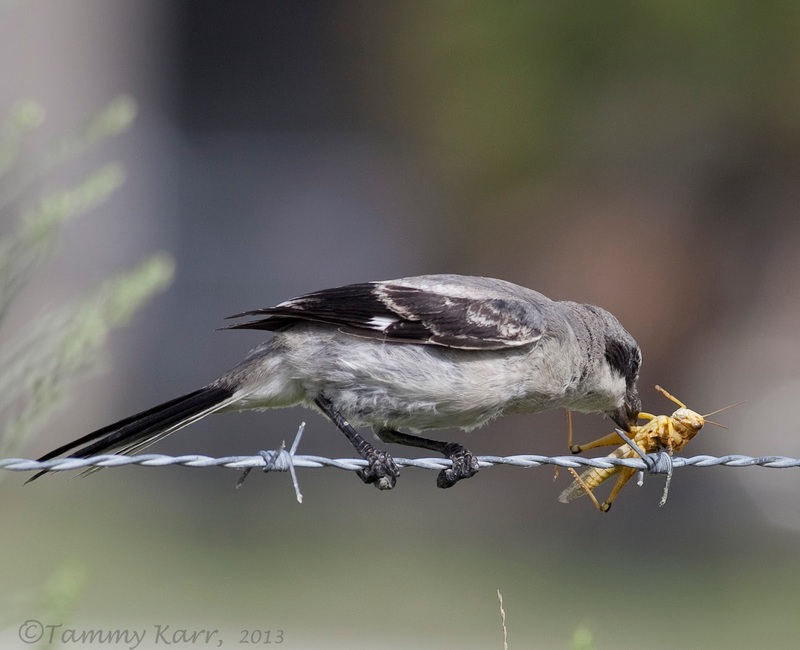 From the car, I was able to snap a few photos of the shrike as it wasted no time impaling its prey on one the fence's sharp barbs. 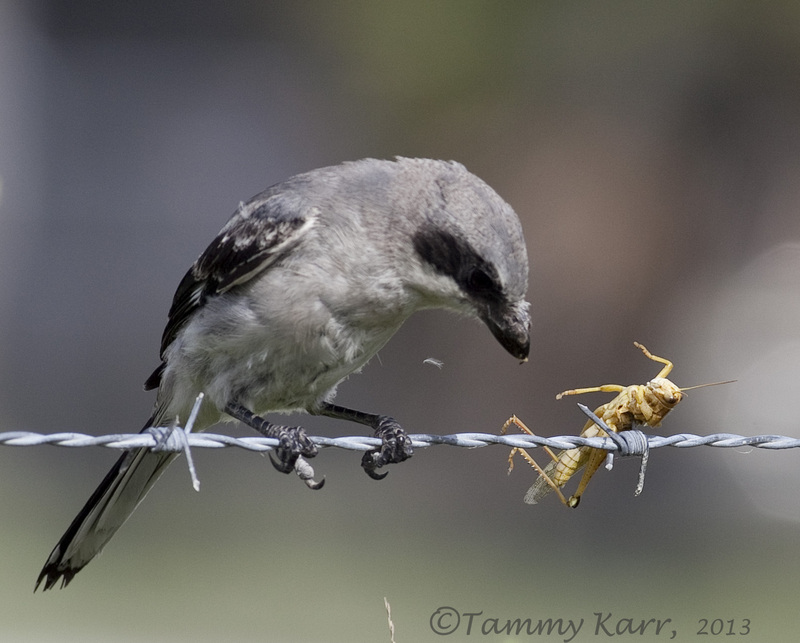 Shrikes are known to use sharp objects to hold the prey they have captured. Shrikes do not have strong enough feet to hold the sizable prey they capture, therefore they hang it somewhere so they can consume it. 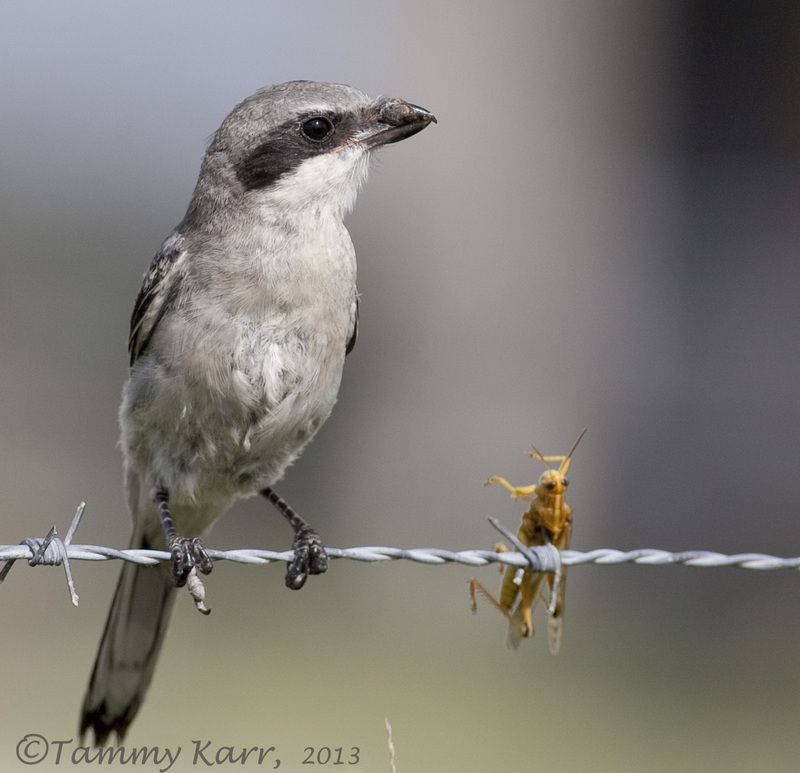 I did notice that this shrike appeared some sort of fungus or injury on its bill. Holy cow, Tammy, what an awesome series of photos. Talk about being in the right place at the right time!! I love your new header picture!! Makes me smile! 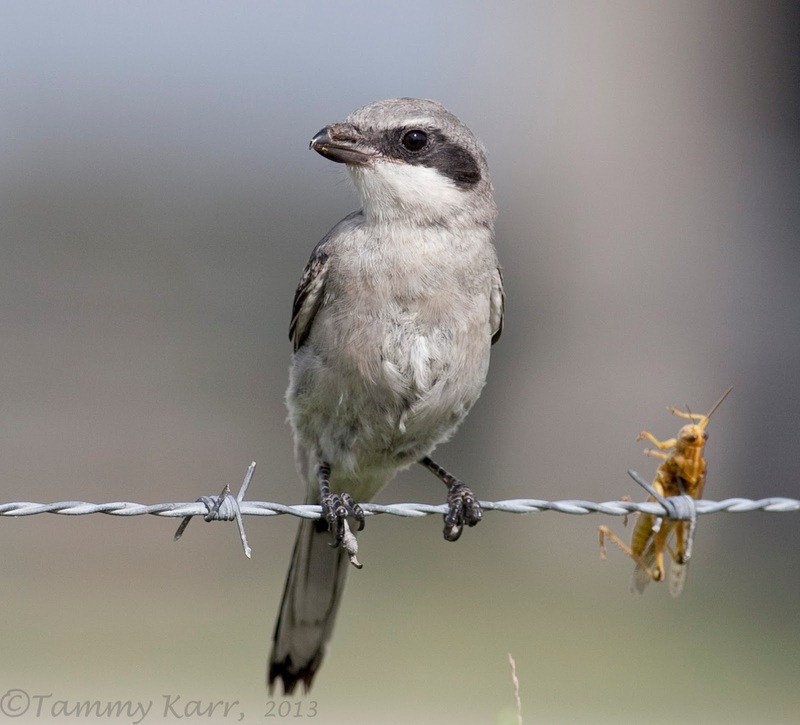 What a beautiful Shrike, oh, not very nice way of murdering it. Super views of the 'Butcher Bird' and its larder. where do you see these things. lol , Great shots, beautiful bird. Photo 4 and 5 are totally awesome. Great shots of the shrike, the grasshoppers are really big ? Take care over there ! This is simply awesome behavior and skill. Impresionante y crudo reportaje de las costumbres de esta asombrosa ave. Muchas felicidades Tammy por tan buen trabajo. That's a pretty smart way to keep your dinner from running off. Tammy, these are awesome captures of the Shrike with the grasshopper! Nice timing, Tammy! Gotta love the Shrikes and their inventive methods! Back from a few days off again, and I come back to discover this magnificent post! From the car is often the way to go and manage great photos! Boy did I enjoy your wasp-dragonfly, such a cute thing. We have no dragons here that would compare! Wow! Amazing series! Congrats, Tammy! So funny to see the hungry eyes of this beautiful bird. The last shot is so great. Very cool pictures, especially the impaled grasshopper! What a great bird to see. Fantastic shots as always Tammy! Superb photographs Tammy, yes that beak does look a little odd. In the UK we sometimes call shrikes 'butcher birds' because of what you describe here, is that a name you have heard? Magnifique cette pie grièche, superbe qualité de photos ! bravo. 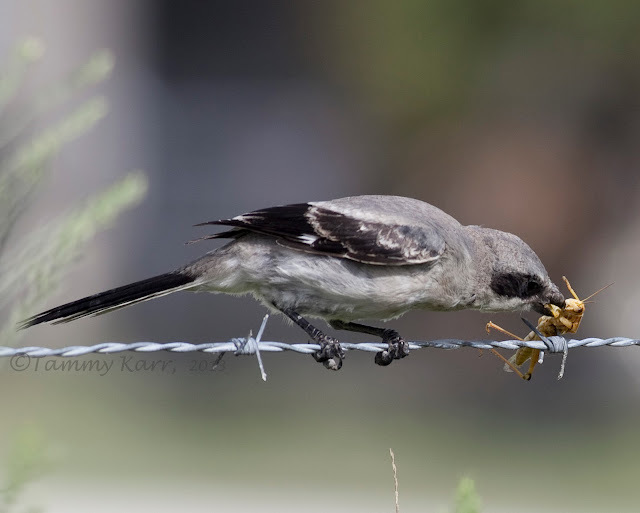 We rarely get to see Northern Shrikes in Connecticut and never loggerheads any more. Fantastic series of photos to see it in action like that. I'm just glad I'm not that grasshopper! I run a blog for Smestow Valley LNR. I have started a nature network to protect our patches and coordinate wildlife surveys. Please could you email me at smestowsightings@gmail.com and I can send you more information. Regards, Chris Millward.